What is the scope of disclosure under the proposed proxy voting rules? What does the practitioner need to know to be ready for the wave of fund acquisitions? And what are the special problems associated with bank-affiliated funds? 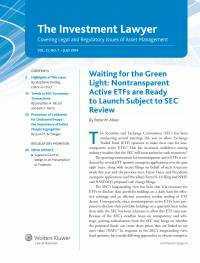 Plus, The Investment Lawyer monitors all of the key regulators -- the SEC, CFTC, DOL, and IRS, as well as state regulators and the Congress -- to keep its readers abreast of the latest regulatory developments and concerns.